Mud Map HD has compatibility issues with iOS7.1 and onwards that's out of our control. Some major features such as track recording has stopped working. If you wish to keep using Mud Map HD, we recommend sticking with iOS7.0 or older. Q: Is Mud Map HD and iPad app? Yes, Mud Map HD is a universal app for iPad and iPhone. What this means is that the interface has been designed to take advantage of the iPad's larger screen and is not just a stretched version of the iPhone interface. At the same time, when using Mud Map HD on the iPhone, it's will use the iPhone interface which works great too. Q: I've upgraded my device / delete the app, where can i redownload it from? iPhone: On the device go to the App Store > Updates > Purchased > Find Mud Map HD and tap the cloud. iPad: App Store > Purchased > Not on this device > Find Mud Map HD and tap the cloud. Q: What maps are included with Mud Map HD? 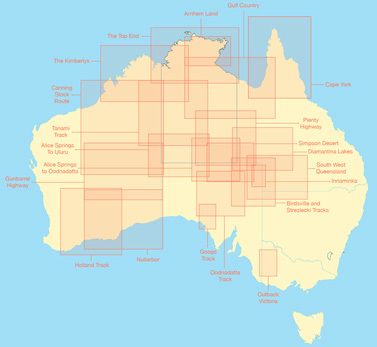 BackCountry 4WD maps 2nd Edition, with Australia wide coverage. Click here to learn more. 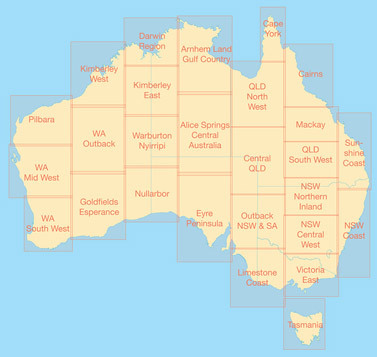 Westprint Outback 4WD maps, providing coverage of popular outback 4WD destinations. Click here to learn more. SmartTOPO topographic map with Australia wide coverage. This is a highly detailed topo map illustrating roads, 4WD track, walking trails and features 10m elevation contours. Q: What type/model of iPad do I need to use Mud Map? iPad Wifi+Cellular models regardless of generation (i.e. iPad, iPad 2) all have built in GPS receivers which is used by the app to determine your location. If you have a WiFi only iPad, which DOES NOT have a built in GPS, an external GPS receiver can be used to determine your location. For more info, see Apple's iPad tech spec page. Q: Will the apps work without phone coverage? Yes, Once the app is downloaded, cellular or internet connectivity is no longer required for navigation. Maps are stored on your device so you can explore in confidence anywhere! Q: SmartTOPO does not zoom out passed a certain range, please explain. All maps are produced to a specific scale/level of detail. Maps with high level of detail provide lots of detail but can only show a limited amount of coverage on the screen at the one time. Think back to a street directory book, they contain detailed map pages and an index map to provide a rough overview while only showing the main roads. Mud Map works the same way. It's bundled with maps of different levels of detail. By using the "maps" button, you can quickly change between maps of different detail quickly. SmartTOPO is a detailed map and is great at displaying smaller tracks such as fire trails. However to obtain an overview of the region, change to a map with less detail such as the BackCountry 250K maps. By using the "Change Maps" feature, you can quickly navigation and find what you are looking for depending on your needs. Q: Can I use maps I purchased for an earlier version of Mud Map? Yes, maps purchased from the Map Store is compatible with the latest versions of Mud Map apps. Q: Where can I buy additional maps? We have a huge range of add on raster maps available from the Map Store. Once purchased, these maps can be downloaded on your device for offline use. Q: I've just purchased maps from the Map Store, are they available for download immediately? Yes, simply follow these step by step instructions to download maps for offline use. Q: I cannot enter coordinates, Why? Clear the coordinates first by using the delete key on the keyboard first, then type your own coordinates in.